The BNSF Railroad Bridge offers a better solution. By resurrecting the 2004 "Vancouver BNSF Rail Bridge Project" the only "stop-light" on I-5 would be nearly eliminated. In Detail: When the Primary Channel lift span of I-5 is open, it provides the tallest clearance (179') under the bridges and aligns with the swing span of the downstream 104 year old railroad bridge. When the lift span is closed the tallest clearance is at the Barge Channels (72'). 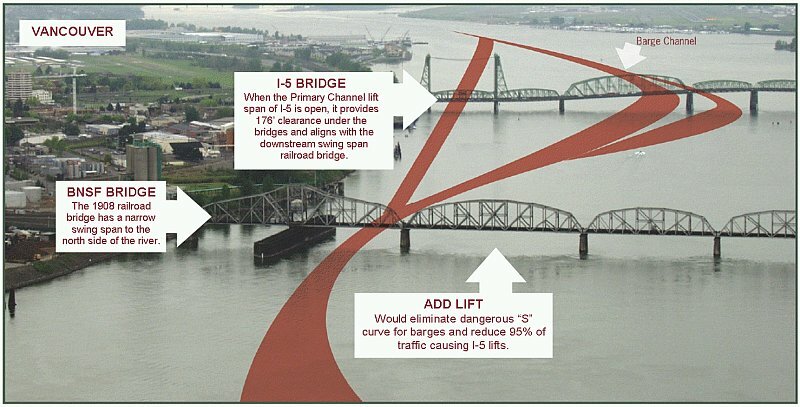 When using the Barge Channels, vessels must navigate an "S" curve between the I-5 Bridge and swing span of the Railroad Bridge. Captains most often use the Primary Channel because the "S" curve maneuver used to avoid lifts is considered one of the most dangerous maneuvers on the Columbia River. Thus, the Railroad Bridge causes most traffic causing I-5 bridge lifts. • Pacific Northwest corridor has received about $1.5 billion dollars in federal funding for rail improvements.